I have this movie that has a video promo of how the movie was made and so on. I want to split away the video promo from the start of the movie it self. But I want to save the video promo as a 2nd block on the dvd along with the movie. So I can go direct to the movie without watching the promo 1st. I know how to trim the start and end of the movie and place the clipped parts in the trash can. But I don't know how to save the clips that was removed from the movie. I can't find any clear cut instructions. I figured a way out to get a separate copy of the video promo by using a prog that I have "Replay Video Capture". RVC can capture video and sound from any source. A video on the HD, internet, cd/dvd. The only problem with RVC when it is 1st installed is getting it to see the sound sources. Once I record the video promo with RVC I will trim the video promo off the movie with mydvd. Trimming off the video promo I can do. I made an extra copy of the original file. So If I mess up the copy. I have the original to fall back to and make an other copy.. I finely figured out 90% of the problem of separating the promo from the movie it self and make the promo it's own separate video using VideoWave, Then I used MyDVD Express to make the menu. (I can't fig the menu setup, as in building the menu, in "regular MYDVD") I got the menu built with 2 sub menu box's for the promo and the movie it self and burned it successfully to a DVD. And it plays fine in a stand alone DVD player. There is just 1 problem. See the red empty box's bellow the sub video links in the attached picture. How do I add a text name under each box as to what the link is for? Also how do I move the links to the videos around on the menu? I need some help in compressing this movie down a bit. it is 00:05:15 to big to fit on a regular 4.7GB DVD + R. Normally I go to MYDVD in Easy Creator. In MYDVD I select "new project" > "DVD, no menu". I go through all the steps of loading the movie and burning the DVD + R blank with no problem. I never ran across a single file that was to big for a single 4.7GB DVD. As I see it. For the Radcon display I have 2 options. 1. I can copy this movie to a large enough USB thumb drive and play it that way. Or 2. Leave the movie on the laptop hard drive. But the operator that operates the equipment will have to take time to search the hard drive for it..
Also I am making a copy of all the Star Trek movies that I have for a friend, a Christmas present. She doesn't allow him to run the computer by him self yet. But he can pick and play DVD's on his own that are pre-scaned by his mother. All I need to do is compress this movie by a small amount to fit on a single 4.7gb DVD. 1 thing I just though of is to split the movie so it will fit on two 4.7GB DVD's. Question can a 8.5GB DVD be formated to play on and stand alone DVD player? I have a few 8.5GB + R blank DVDs. That does not leave a lot of choices. You can change the quality to something like SP or Same as Original but you will take a real hit in your output quality! Fit to Disc setting does nothing more than change it to SP, LP or EP in those jumps. Would be nice if it just changed it enough to fit but that IS NOT how it works! Next choice is to use the 8.5 GB discs. Don't know what you are thinking about format with these??? 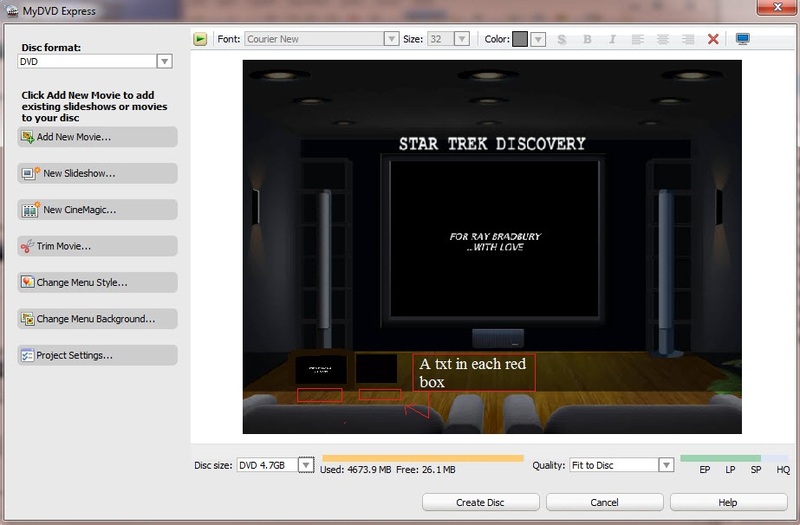 If you create a DVD Movie, as MyDVD does, they will be playable. Now some Players do have trouble with burned 8.5 GB discs, you will just have to see. Please tell us what version you actually have and we will move your posts to the correct forum.